GP con barrage, 69 participantes, 23 sin falta, 13 dobles ceros, 7.500€ el ganador, diseño del austriaco Franz Madl. 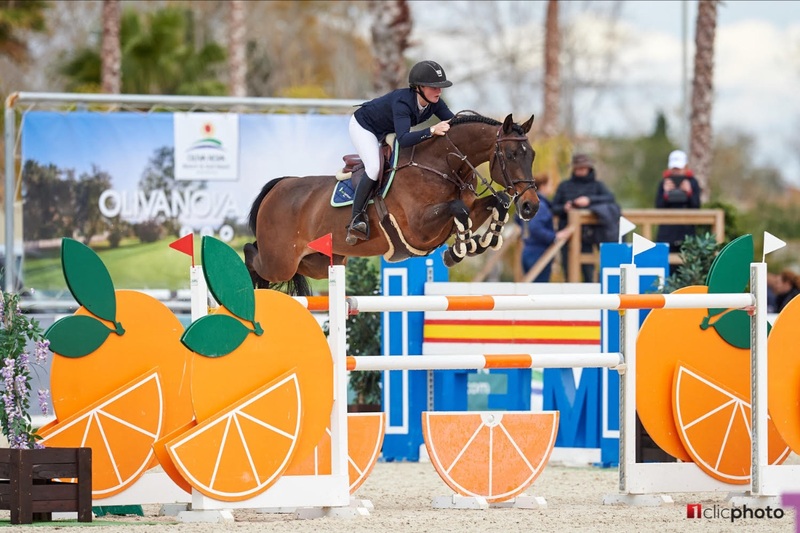 In the first CSI2* Grand Prix of the Mediterranean Equestrian Tour 2019-season, it was last-to-go Sanne Thijssen (NED) who outclassed the jump-off field consisting of 22 other riders. Sunday’s CSI2* Grand Prix presented by Oliva Nova Beach & Golf Resort was set at 1.45m and offered valuable world ranking points, but with no less than 23 of the 69 horse-and-rider combinations in the class moving onto the jump-off it was obvious you needed to be fast to have a chance for the podium.“The course was actually difficult enough, still there were 23 clears – but there are many good riders here,” Thijssen explained after her win.Many of the world’s best riders were among the qualified for the jump-off after producing clear rounds over Franz Madl’s Grand Prix track. The first to really set the standard was world no. 40 Jerome Guery (BEL) on the 10-year-old Kel'Star du Vingt Ponts (Kannan x Landor S), who brought the leading time down to 42.33 seconds after a very efficient round. A few riders later, Marlon Modolo Zanotelli (BRA) – another rider well-known for his speed – slotted into second place with J-Figyelem (Vingino x Animo), 0.39 seconds behind on the clock. However, David Will (GER) and Forest Gump 29 (Forsyth x Feuerwerk) soon pushed Modolo Zanotelli down to third with 0.18 seconds separating him from the lead. As third last to go, Pedro Veniss (BRA) – winner of Saturday’s world ranking class – and For Felicila (For Pleasure x Espri) did what they do best and blazed around the shortened track to cross the finish line as new leaders in 42.09 seconds. It was not to last though, as the only 20-year-old Thijssen was the one to steal the show as the final rider in the ring on the 13-year-old Bulavsco (Verdi TN x Corland). Thijssen took a short-cut to the combination midway and also left a stride out to the following oxer, before getting a perfect turn to the penultimate vertical to shave the time down to 41.72 seconds – beating the boys occupying the top five. “My horse felt really good today, he jumped amazing – he had a month’s break and he is back fresh again,” Thijssen said. “Bulavsco has been in our stable since he was six, and I rode him for the last two years. He is my best horse at the moment, and I took him here as he really enjoys the sun!”“In the beginning of the jump-off I was quite slow, I did not see my forward distance to the third fence.” Thijssen explained. “However, I did the six strides from the double to the oxer in the middle and nobody else did so I think there I made up some time. The turn back to the penultimate jump was good, he can turn unbelievable – so it was definitely during the last part of the course that I won it.”Sanne Thijssen made her MET-debut this week, but will surely be back again in Oliva Nova. “It is my very first time here, but I really like it!” concluded the happy winner. The Spring MET I 2019 continues next week, running through to Sunday 27th of January when the first part of the Tour concludes with the CSI3* Grand Prix presented by CHG.